Well so much for spring break. This morning when we awoke it was snowing. I could hardly believe it. Have I mentioned that I am ready for spring. At least it didn’t accumulate. I feel sorry for all the school kids who are on spring break this week. Speaking of school I have come to a conclusion, after much prayer and meditation, that we will be going year round. I mean learning never really stops so why should we? I feel this way I just need to make sure we get our 180 days accounted for and take off whenever we need to. Of course like “Christmas school”, “Summer school” will be much more relaxed academically. 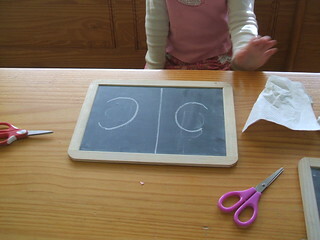 Yesterday we kept ourselves busy with more symmetry activities. 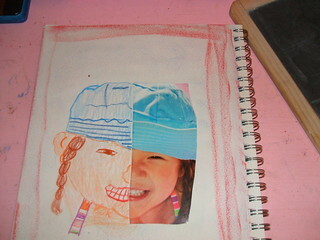 The Little’s each picked out a picture and split it down the middle to complete the other side. 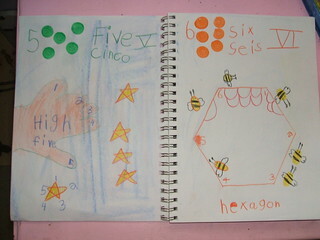 Little Sis also added the numbers 7 &8 in her math MLB. I found a couple of really cool series at our library this week entitled Childcraft The How and Why library as well as the I Love Math series by Time Life books. Both these series have great hands on activities and stories. I have tried to find them on-line and they are no longer in print. Which really stinks because they are an excellent resource to have around. 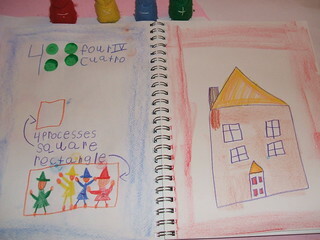 Since we are working on geometry we are reading our way through The House That Math Built. Little Sis loves these kinds of books and I am having a hard time finding books for her. Every time we get any books in the mail she always asks “Is this for me?”.Oh well guess I will just have to keep checking them out. Today was all about puzzles. I cut an old painting in half splitting it between The Little’s. 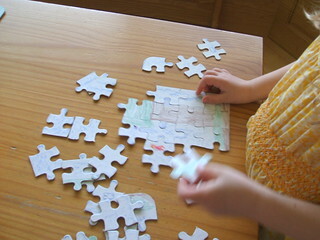 Then they each cut out one piece at a time until putting the puzzle back together became difficult. It took Miss Sky 7 cuts before she forgot how she cut it. 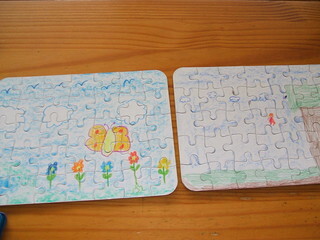 Then using blank puzzles ,I purchased through Bare Books ,The Little’s made up their own. Then we pulled out 2 of our most favorite games. Blink (Papa and I still disagree as to who the champ is of this game) and Spot it. This has been the new game of the year. It is small enough to take anywhere. For reading I assigned Miss Sky Stuart Little by E.B. White for her independent read. 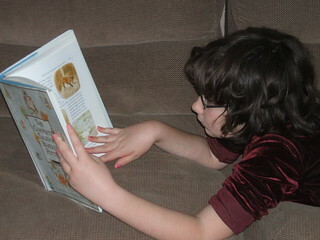 She has read to chapter 7 and is enjoying it a lot. I really don’t like to assign reading but I think sometimes she gets overwhelmed by the choices of books we have to read and it makes it easier for me to choose. 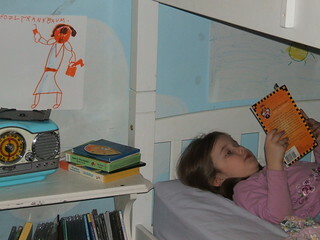 Little Sis read books 12 and 13 of the I see Sam books. She is beginning to spot out words she knows during our storytime and is even reading whole sentences at times. I read to chapter 7 of our read aloud Dragonfly and the Web of Dreams by J.H. Sweet (book 2 of the Fairy Chronicles). Well I think it is safe to say we had another great Earth hour this year. We try to turn off our power every couple of months, not just to save on resources but for the quality time we spend together as a family. No computer or T.V. just us. We tell stories and like to play where someone starts the story and each person takes turns adding to it. 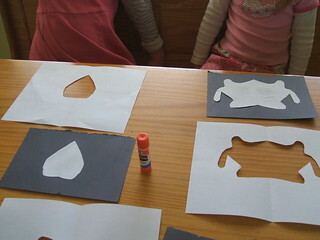 We have had shadow puppet theater and even acted out The Little’s favorite fairy tales. This year we played charades. Oh man I think the best one of the night was when Papa had to be a frying pan :). Today was library day. 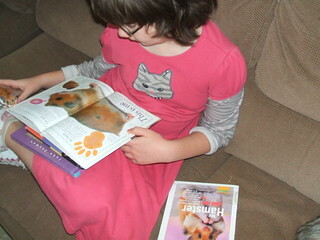 I picked up more math books for Little Sis and Miss Sky decided this week she wanted to study hamsters. I SO see where this is heading. Continuing with our math block we started our lessons with Miss Sky and I tossing the beanbag to the times tables. She is already starting to increase her speed. 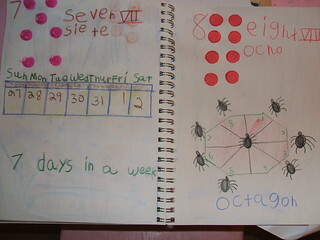 Little Sis and I tossed the beanbag counting to 100 and while saying the days of the week (to go with the number 7). 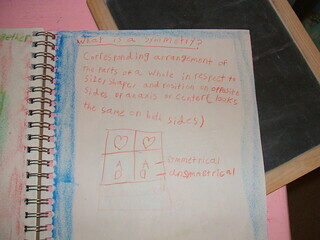 Then we did the Simple Symmetries activities from Family Math by Jean Kerr. 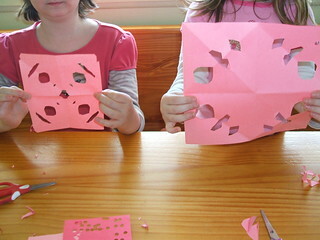 These activities help children develop an understanding of bilateral symmetry and geometric patterns. 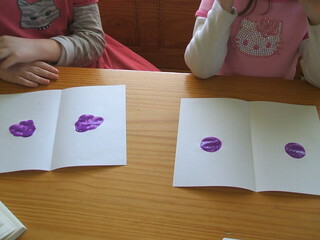 First we started with Blob Pictures by putting a glob of paint on one side of a piece of paper then folding the paper together. This helped explain what symmetry means. 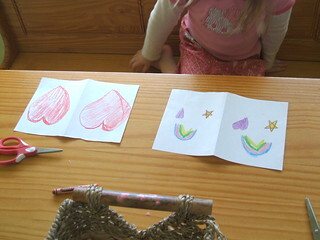 and they drew symmetrical pictures. 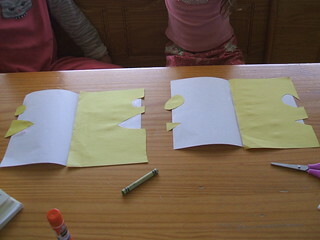 For our last activity we took letters of the alphabet to see how many were symmetrical. I am impressed how fast Little Sis caught on. For reading today Little Sis read book 12 of the I See Sam series. She has been getting in and on mixed up as well as sit and sat. 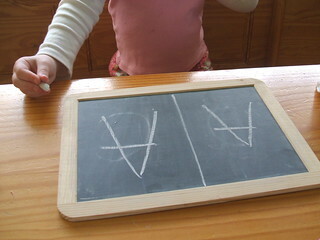 I wrote these words up on the board to help her work on them. Miss Sky read aloud chapters 3 and 4 of The Stupid Smelly Bus to Little Sis, and I read aloud to chapter 3 of Book 2 of the Fairy Chronicles. One of the girls, that has fairy powers, is homeschooled. I think it is great the author included a homeschool girl into the story for a change. 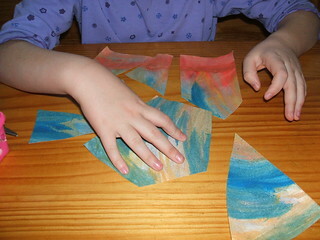 There has also been lots of playing with pattern blocks. These have been a huge hit with Little Sis who’s been playing with them all weekend. 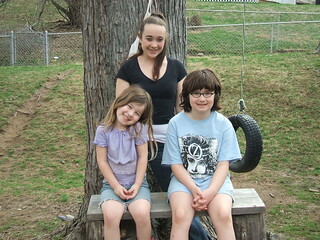 Okay you may have noticed earlier in the week a picture I took with the girls in shorts. That is because it almost reached 80 degrees. The windows were open, sheets were blowing in the gentle breeze. Then what happened you might ask? We had quarter size hail, tornado warnings, and today there is a fire in the wood burning stove. Yesterday the temperatures didn’t even make it out of the 30s and it looks like this weather is here to stay for a while (BLAH). and shapes. 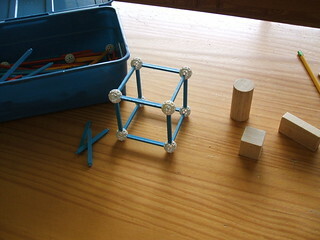 Miss Sky has been working on making 3 dimensional shapes with Zome. You could do this with toothpicks and gumdrops or play-doh too. Miss Sky finished her report on gorillas. She picked which facts she wanted to write down and wrote the whole thing herself. I just helped her proofread and circled misspelled words she needed to look up in the dictionary. I am pretty proud of her. She chose not to write about how they are being killed and I respected that. We finished the first book in the Fairy Chronicles series by J.H. Sweet and are getting ready to start book 2.Little Sis read books 11 and 12 of the I See Sam books.Miss Sky didn’t do any independent reading this week on account of reading books for her report but is reading Junie B. Jones and the Stupid Smelly Bus by Barbara Park for Little Sis’s read aloud. Oh yes so many negative reviews of Junie B but you know we (yes I said we, Papa too) really like this series. My girls read many books of wonderfully written literature but sometimes you just crave pizza if you know what I mean :). Wishing everyone a great weekend!!!!! PS Have you seen my friend Sally’s new blog? If not check it out she has a wonderful give-a-way going on for some handmade soap. PSS Don’t forget about Earth Hour tomorrow. Even though we stopped our alphabet block with the letter F the Little’s have decided to continue without even knowing it. I had picked up a bunch of introductory math books while at the library and while reading Shapes by David Kirkby to Little Sis I soon realized there where shapes that Miss Sky had not gone over, like rhomboid, cube, sphere, and others. SO that lead us into our next math study and it fits in well with Little Sis’s study of numbers. The Little’s however are not the only ones who were lead on their own independent study :). 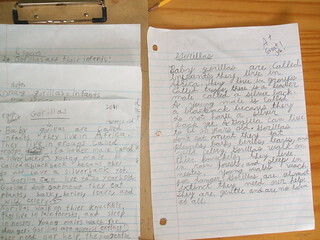 Miss Sky has read 5 books and watched one documentary on gorillas to take notes for her report. Our documentary was a nature special called The Gorilla King. It talked about a gorilla ,named Titus, that zoologists have been following since it’s birth in 1969 by Dian Fossey. Since, during our animal study, we are studying naturalists (women especially) I thought we should add Dian Fossey to our list. I have not seen Gorillas In The Mist but it is next on my list. I found it very disturbing that someone could kill these creatures just for their skull or hands. Well during this documentary we found out that some mountain gorillas live in Rwanda Africa and that for 10 years the study on Titus had to cease because of the civil war that happened there. This of course lead me to Hotel Rwanda. 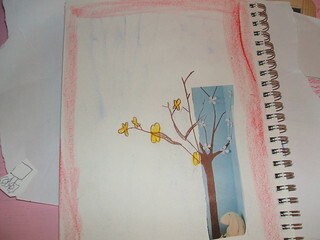 There is SO much I want to say about my study but I know that my homeschooling blog is not the place. However I do believe that knowledge is power and thought maybe just by mentioning these topics might interest others into their own independent study. Now that Miss Sky’s research is through she will start writing the rough draft of her report. Today we talked about what The Little’s learned from reading the book Shapes and Miss Sky made a picture of a tessellating pattern in her MLB. 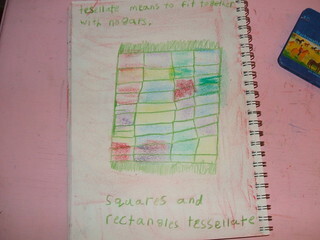 We also looked around the house and pointed out any tessellating patterns we saw. 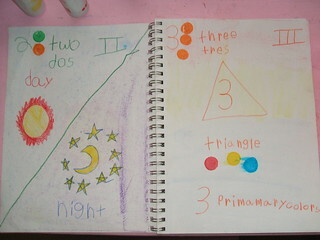 Little Sis made her picture for the number 4 and she drew a picture using some of the shapes she knew. I also introduced her to the 4 processes. She is so excited to finally get to learn with the gnomes. Then the Little’s played with the tangrams while Miss Sky made tessellating patterns. For reading Little Sis read books 10 and 11 of I See Sam, Miss Sky read her last book on Gorillas, and I read to chapter 6 of The Fairy Chronicles book 1 by J.H. Sweet. The girls are really loving it so far. I love that the fairies are real girls working together to change the world. Like Thorton W. Burgess’s books there are lots of educational tidbits thrown in, like I think we will be planting some marigolds in our garden this year. It was great to have you home Sissy! 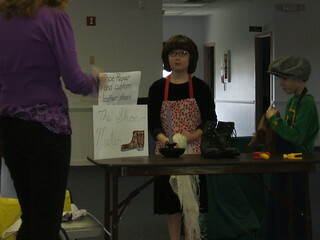 Yesterday was Miss Sky’s performance of The Elves and the Shoemaker. 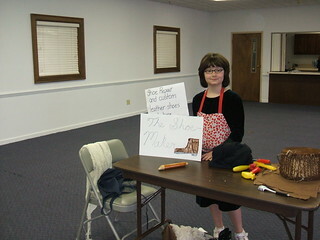 She played the shoemaker’s wife. She had no trouble playing the part of a wife, Papa said she couldn’t have been better (I wonder what he means by that ). She is definitely ready to advance into beginning acting, with the rest of her friends. They are doing the play Tom Sawyer this quarter and we can’t wait to see it. PS. Don’t forget about the supermoon tonight. If you have not heard of Salman Khan’s web page you have just got to check it out. I have the link on the side under homeschool. What a wonderful example of how one person can truly make a difference. Yes, it always feels so refreshing coming off of a short break. Especially when you get so much accomplished while you are off. I will admit that this break was more important to me then to the Little’s. In fact one child (hmm wonder who I am talking about) refused to accept we were on a break from school. If you have been following along with my abrupt change in plans this year, you know I have been doing a lot of thinking about schooling and learning in general. I have found myself wondering why or how I have “allowed” myself get into this academic race to get done. There is more to homeschooling than academics and this was just the break I needed to remind myself of that. Children need breaks from school, adults need vacations from work, yet I somehow forgot to take a break for myself. There were projects around the house( you know the ones that we deem unimportant that keep getting put off) that needed to be attended to. Well today we eased ourselves back into school mode by starting a math block. Miss Sky has officially finished her fraction workbook and I can honestly say she really gets it. She knows what an improper fraction is, she knows how to make a proper fraction improper, she can add and subtract fractions, she can add and subtract whole numbers and fractions, and she can add and subtract 3 and 4 fractions at a time (Yes ). Now to work on her logical thinking skills but first a multiplication review. Miss Sky has also mastered her times tables “but” if we don’t keep practicing she will forget. I am really not all into drill and kill and either is she however I do think I have found a fun way to work on them, multiplication war and a mp3 copy of A Child’s Introduction to Multiplication Tables. We listened to the tables while tossing the beanbag back and forth. Both were a hit. 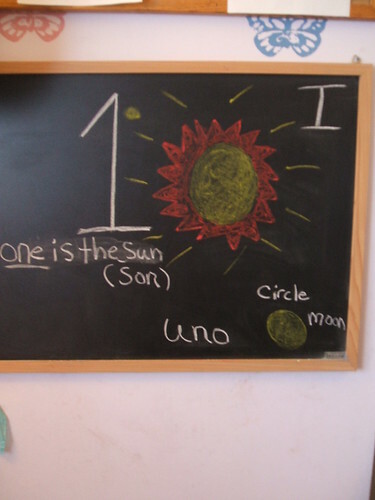 Even though Little Sis is way past this stage of numbers, she is adding without manipulatives, it is important that children have a concrete understanding of what numbers are. So today was all about the number 1. We talked about what this number means and I asked her to give me 1 gem. 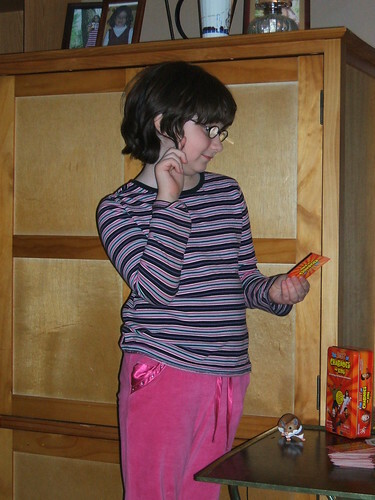 Next I asked her to point out on herself what equaled 1 while looking in a mirror. 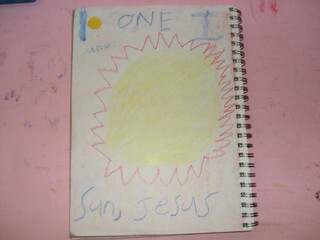 She also came to the conclusion there is only one of her. Then I gave her “THE” math book. OMGoodness she was SO excited and had to come out of the schoolroom to show everyone. 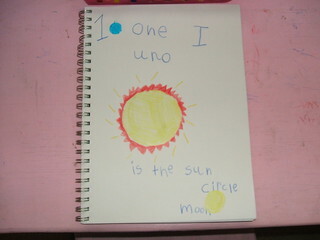 Then she made her first page in her new math MLB. Miss Sky is still working out of her same math MLB and Little Sis just had to compare pages with her. Then Little Sis and I tossed the beanbag around while we counted all the way to 100. For reading Little Sis read I See Sam books 6-10, we will continue with books 9 and 10 the rest of the week. Miss Sky read the book Fairy Houses by Tracy Kane to Little Sis and I am finishing up our read aloud of The Giant Golden Book of Elves and Fairies by Jane Werner just in time for St. Patty’s Day. Our local PBS station is airing a 2 hour documentary on what Indy was like during the 60s. I thought I would mention for any locals that might be interested. It starts at 8 pm on WFYI.